Many deadly diseases strike black Americans much harder than and more often than the average white American according to Clyde W. Yancy, MD, associate dean of clinical affairs and medical director for heart failure/transplantation at the University of Texas Southwestern Medical Center. Naturally, diseases and responses to treatment do vary from person to person. But, Yancy adds, there are unique issues that affect black Americans. genes, environment, and socioeconomic status all play a role in the effect of diseases on their host. A sample population of the National Longitudinal Mortality Study from 1979 through 1981 was analyzed and followed up through 1989. The study came to the conclusion that in the United States, infectious diseases account for nearly 10% of the excess all-cause mortality rates in blacks compared with whites. One of the diseases among the black American community is Sickle Cell Disease, more commonly, Sickle Cell Anemia. With this disease, the hemoglobin is abnormal, causing the red blood cells to form a “C” or sickle shape. Sickle cells can get stuck and block blood flow, causing pain and infections, also known as a “sickle cell crisis.” The Center of Disease Control and Prevention estimates that Sickle Cell Anemia occurs in about 1 out of every 365 black American births and about 1 in 13 black American babies is born with sickle cell trait. Diabetes occurs when the body is unable to regulate the amount of glucose in the blood. Insulin is a hormone produced by the pancreas, which regulates the blood glucose level between certain limits and the production of glucose by the liver. According to The US Department of Health and Human Services Office Of Minority Health, black Americans are almost twice as likely to be diagnosed with diabetes as non-Hispanic whites. In addition, black Americans are more likely to suffer complications from diabetes. High blood pressure is most closely related to higher rates of obesity and diabetes in black Americans. According to the American Heart Association, the prevalence of high blood pressure in black Americans in the United States is among the highest in the world. More than 40 percent of non-Hispanic black American men and women have high blood pressure. For black Americans, high blood pressure also develops earlier in life and is usually more severe. The American College of Cardiology conducted a study known as the CARDIA Study or the study of Coronary Artery Risk Development in Young Adults. It included 3,890 adults between the ages of 18 and 30 for thirty years. By the end of the CARDIA study, 75% of blacks had developed high blood pressure, compared to just 55% of white men and 40% of white women. Depending on participant’s initial blood pressure, this difference translated to 1.5–2 times greater risk for hypertension among black adults than whites. A stroke is a sudden interruption in the blood supply of the brain, mostly caused by abrupt blockage. 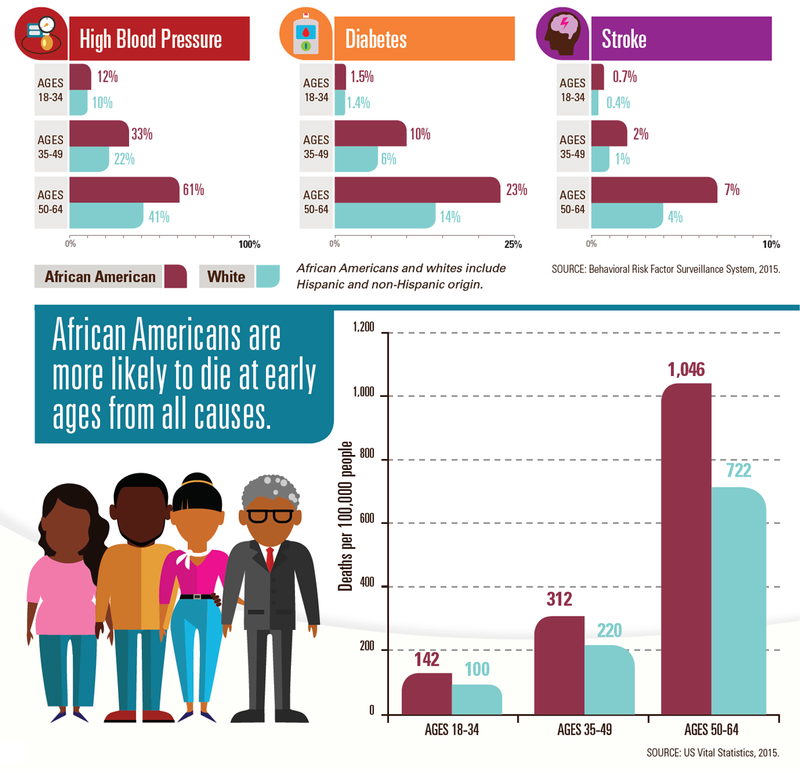 According to the National Stroke Association, black Americans are more impacted by stroke than any other racial groups within the American population. black Americans are twice as likely to die from stroke as white Americans and their rate of first strokes is almost double that of white Americans. To fit the basic qualification of a Preterm birth, a child is usually born fewer than 37 weeks of age. According to Arthur James, an OB-GYN at Wexner Medical Center at Ohio State University in Columbus, premature black babies in the U.S “die at just over two times the rate of white babies in the first year of their life.” According to The U.S. Centers for Disease Control and Prevention, for every 1,000 live births, 4.8 white infants die in the first year of life. For black babies, that number is 11.7. “The majority of those black infants that die are born premature,” says James, because black mothers have a higher risk of going into early labor.